Hi! I'm newly engaged as of 04/08/13. I haven't a clue of what I'm doing, and I really want a fall wedding, but with my fiance being in the Marine Corps (and half of his family & friends being in the military and some of my friends being police officers/state troopers) I really want my colors/bridesmaid dresses to compliment their uniforms...BUT ALSO compliment the fall season. And I don't really want red or yellow because my cousin already had a fall-red wedding and my brother had a spring-yellow wedding. Please Please Please Help Me Out! We get this question like 3 times a week. Our typical answer is also in the thread at the top that says "Read Before Posting". Uniforms are considered nuetral. Pretty much anything goes with them. Just pick colors you like. You could do gold, champagne, black, a soft coral/peach or mint. It also helps to ask your bridesmaids. They may not look flattering in certain colors. Don't want them to feel uncomfortable in their dress! Champagne or gold is a really good color with fall weddings but they don't look great on everyone in the shinier hues. It seriously grosses me out when people use parts of the uniform as props. OP, I agree with TX. As far as fall colors go, I think burgundy, forest green, warm golds, burnt oranges. Those colors will likely look better on your bridesmaids. My cousin used champagne as a color and it washed a lot of girls out. You can use whatever you want, really. There aren't many fall colors that "clash" with the MC uniform. That said, you don't have to try to coordinate with their uniform. Think of it like a regular tux and pick whatever color you want to use. Seriously. And I am shocked a Master Sergeant agreed to that. [QUOTE]In Response to Re:Bridesmaid Dress Colors...HELP!!! : Seriously. And I am shocked a Master Sergeant agreed to that. Word! 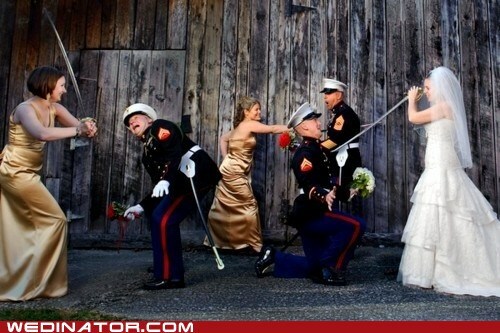 Some one please tell me what's funny or cute about a bride and bridesmaids killing the groom and groomsmen with their swords. All of you really helped. Oh My! I would never think of doing any photos like that....WHILE they're in their uniforms. HAHA! Now, I just need to figure out other things. You really helped. I just hope I can finally look at the wedding and think...Fall And Dress Blues Don't Clash!